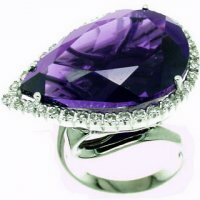 A Bold and Beautiful Diamond & Pear Shape Amethyst Dress Ring. A Stunning Amethyst and Diamond ring composed of a large pear shape amethyst, horizontally set and mounted within a single row surmount of brilliant cut diamonds to a stylish twist style shank. All set in gleaming 18ct White Gold. The diamonds weigh 0.35cts in total. 18k Gold.